Help Us Make A Difference During the Month of November 2013! For the month of November, Republic Storage will be hosting a food drive for the Elks Meals on Wheels. Beginning November 1st, drop off any canned or non-perishable food at any of our 17 Republic Storage locations. Republic Storage was proud to be a Title Sponsor for the 12th Annual ACHD Charity Golf Tournament. To be held on September 14th benefiting the Wyakin Warrior Foundation. career through education and mentor-ship. Help Us Make A Difference During the Month of July 2013! Your gift of footwear is important to children and adults around the world. children obtain an education – as many schools have footwear requirements to attend. When you take the time to RECYCLE YOUR FOOTWEAR you are in fact changing lives. Republic Storage location or at INside OUT Salon,591 E. State St., Eagle, ID. Help Us Make A Difference During the Months Of March & April 2013! 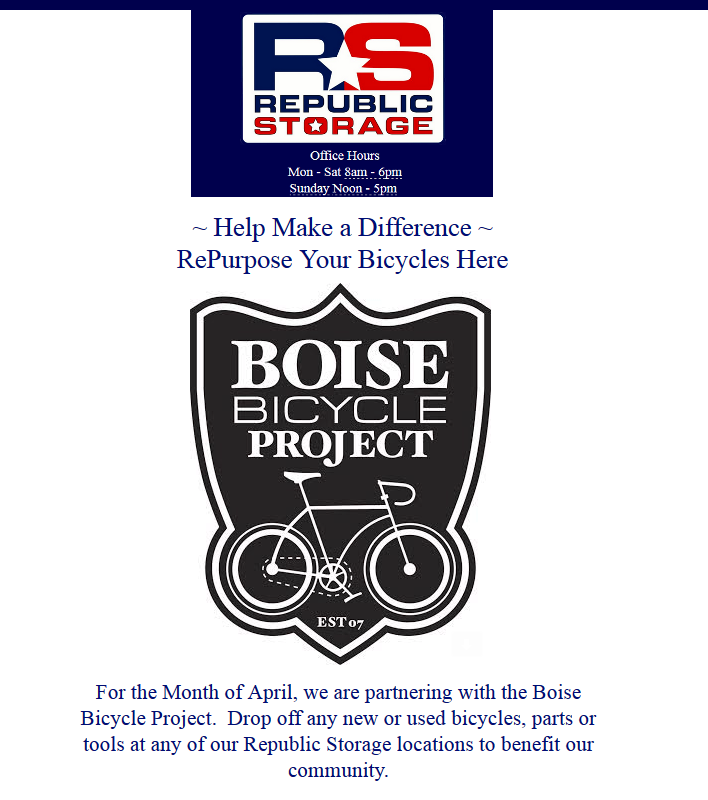 Republic Storage is excited to announce that we will be collecting donated bicycles, parts and tools for the Boise Bicycle Project. The BBP is a community-oriented effort to promote the personal, social, and environmental benefits of bicycling. It functions as a bicycle recycling center as well as an educational workspace in a diverse and non-threatening atmosphere. Through education and access to inexpensive bicycles they strive to build a stronger bicycling community. Bikes that are donated to the BBP are fixed by volunteers and then checked over by BBP’s certified mechanics. When a bicycle cannot be repaired, it is stripped down and the parts are used to fix other bicycles. to any of our 17 Treasure Valley locations.